Can I leave my Ponytail Palm in its pot and place it in a sunny spot in the garden? I propose to remove the turf around the pot and place it in the shallow hole. 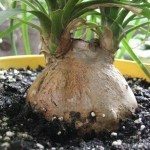 Yes, as long as the climate is correct for your ponytail palm to live outdoors throughout the year, you can bury it in its pot as you describe. Make sure it ends up level with the same soil line as it has in the pot.